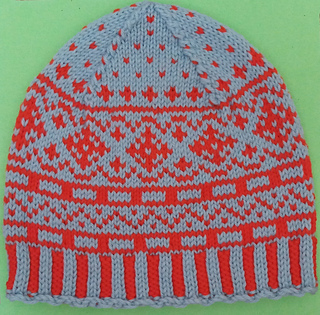 This is the first in a range of colorwork hat patterns that I’ll be introducing. 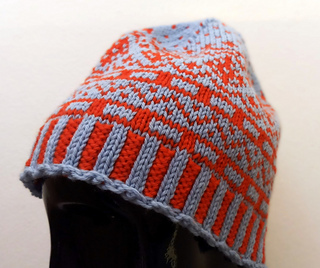 Fair Isle patterning is one of my favorites and it seemed like a good place to start. 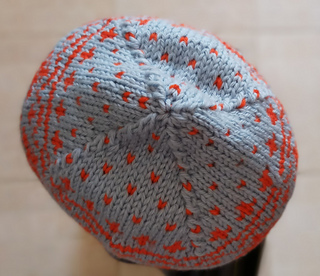 The traditional designs can be simple or complex and I like the clean look of a simple two-color pattern: in this case, in the colors Summer Sky and Tiger Lily (just under a half skein of each). This was knit for an adult size large (up to 24 inches - or 61cm). The actual finished size is 19-1/2” in circumference and 9-1/2 inches from the bottom of the band to the top of the crown (49.5x24cm).